Group: Rare, working, or guardian breeds of dogs. 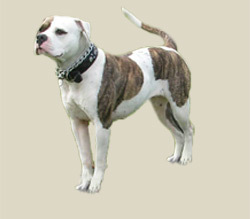 The American Bulldog remains higher on the leg, more agile and swifter than its English counterpart. Some individuals are reportedly able to leap six or more feet into the air. The American Bulldog is a very muscular, sturdy dog with a large, powerful head and jaws. He is very strong, but agile and light on his feet. The chest is wide and the muscular neck tapers from shoulders to head. The neck may have a slight dewlap. The head is square and broad with muscular cheeks and a furrow between the rounded eyes. The strong muzzle is shaped like a box. The stop is sharply defined and deep. The teeth should meet in a tight undershot, even or scissors bite. A variety of ear types are acceptable including rose, half-pricked and pendant. Though some people crop the ears, uncropped ears are preferred in the American Bulldog Breeders Association Standard. Any eye color is permitted, but black eye rims are preferred on white dogs. The nose is black or grizzle. In black-nosed dogs, the lips should also be black, though some pink is permitted. The lips should be loose. The heavy-boned front legs should be strong and very straight. The hindquarters should be very broad and muscular. The low-set tail begins thick at the base and then tapers to a point. The short, harsh coat comes in combinations of solid or varying degrees of white, all shades of brindle, brown, red, or tan. The sturdy and powerful, yet compact frame, is characteristically stockier and heavier boned in the males and more refined in the females. The American Bulldog is loyal, reliable, brave and determined. Not a hostile dog. Alert and self-confident, this breed genuinely loves children. It is known for its acts of heroism towards its master. They have strong protective instincts, and need a firm, confident, consistent pack leader. Well-socialize and obedience train them at an early age, to prevent them from becoming reserved with strangers. Without that strong minded pack leader who can tell the dog what is expected of them, they may be aggressive with other dogs. They need to be around people and know their place in their pack to be truly happy. This breed tends to drool and slobber. Without enough daily mental and physical exercise they will become high strung and may become hard to handle. American Bulldogs are at their best when they are given a job or task to accomplish. These dogs love to be walked frequently with a secure leash. They enjoy playing with family members and romping and roaming in a generous yard. The American Bulldog should be exercised on a daily basis for at least one hour a day regardless of the weather conditions. Keeping your bulldog indoors is fine, but you must make sure it has sufficient exercise. Just as long as you are able to give your bulldog sufficient exercise so that they can release their pent up exercise, your dog will be happy and healthy.